There are basic design rules for fluid dynamics, which allow you to jumpstart your design without having to resort to fundamental experiments or analysis. What are these rules? Before you press the run button for your Computational Fluid Dynamics (CFD) simulation you should configure your results to provide feedback on the simulation's progress. In most modern CFD systems, such as Caedium, you can use co-processing to update your results simultaneously while your CFD simulation runs. Assuming you have the option to co-process your CFD results then here are some helpful tips on how to proceed. Being a small business ourselves we understand that one of the key issue that drives many Small-to-Medium-sized Businesses (SMBs) is efficient resource allocation. For Computational Fluid Dynamics (CFD) simulations, our area of expertise, that means the SMB wants their needs precisely met in terms of pricing, features, and support. To address these issues, Symscape offers flexible duration subscriptions to Caedium that include support and various bundled features in Caedium add-ons. There are no initial sign up fees and no re-sign up fees. You are ready to try Computational Fluid Dynamics (CFD), so what next? It's time to jump in and let Caedium show you what a CFD tool can do through this collection of Caedium posts from 2015. Every year we perform a diverse selection of Computational Fluid Dyamics (CFD) simulations. Did you miss any last year? Just in case you did here is the complete set from 2015. The beginning of a new year is always a good time to review the lessons learned from the previous year. In terms of Computational Fluid Dynamics (CFD) we had a bumper crop of advice and tips for you in 2015, so take a look and see if you missed any the first time around. 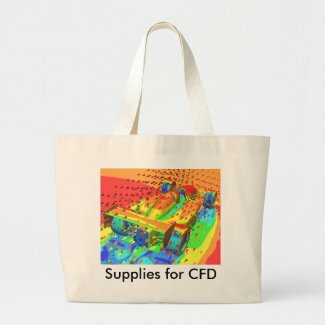 Gift giving season is upon us, so why not put your Computational Fluid Dynamics (CFD) visualization skills to good use and make some unique CFD themed presents this year? I did. A Computational Fluid Dynamics (CFD) simulation requires that you configure physics and solver values based on your knowledge of your fluid application. Primarily this setup stage requires defining your fluid state, reference values (e.g., velocity), initial values, boundary conditions, and solver parameters. Follow along as I describe each stage and relate it to a CFD simulation of the external airflow over an idealized car. Meshing in a single, integrated simulation environment (e.g., Caedium) for Computational Fluid Dynamics (CFD) is different, in a good way, from meshing in a dedicated mesh or post-processing tool. An integrated CFD simulation environment has the standard meshing tools, but in addition upstream you have a full geometry engine to create and modify geometry as needed, and downstream you can use the same meshing tools for visualization, such as seeds for streamlines and surfaces for results interpolation. You are not forced into a linear progression through the CFD simulation process, because often it requires multiple visits backwards and forwards (non-linear) through the tool chain to get to a final result. Also the visualization of mesh metrics (e.g., surface mesh quality) is identical to general flow field visualization (e.g., pressure), which minimizes the number of concepts you need to learn. Given the option, it is often better to create geometry specifically for your Computational Fluid Dynamics (CFD) simulations. It is even better if your CFD system supports geometry creation. Then you can stay within a single integrated simulation environment for your entire task without the need to learn or purchase additional software packages.